US military planes bombed an Islamist-held town in Somalia near the Kenyan border overnight killing at least four civilians, local elders said Monday. 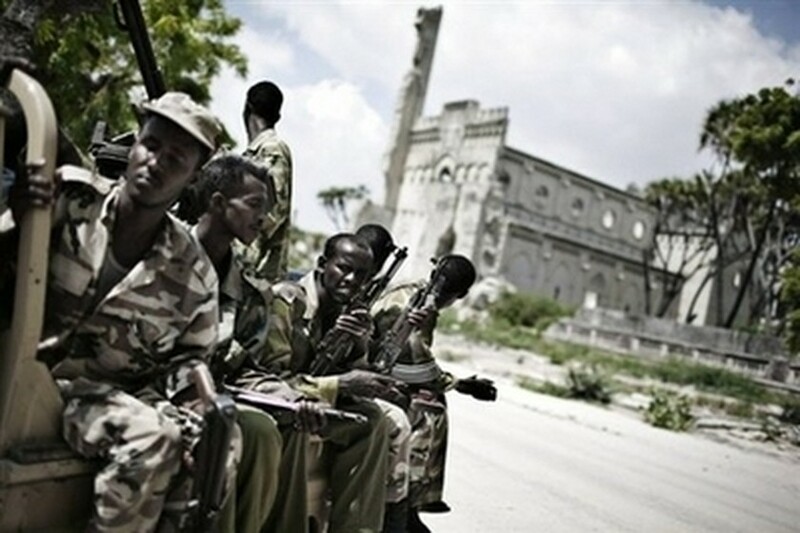 File picture shows Somali soldiers in Mogadishu. "It was later in the night -- around 3.00 am -- when a US aircraft dropped three bombs into the Dhoble town. They fired at three targets, including two houses and four civilians were killed," said elder Abdullahi Sheikh Duale. Sheikh Mukhtar Robow, a spokesman for the Islamist movement which is leading an insurgency against the Somali government, confirmed the attack. "I can confirm to you that the Americans bombed the town and hit civilians targets thinking that they were Islamist hideouts. They used an AC 130 plane," Robow told AFP. If confirmed, this would be at least the third time the US military will have conducted operations inside Somalia since 2007. In June 2007 a US Navy destroyer shelled suspected Al-Qaeda targets in mountainous and remote areas in northeastern Somalia where Islamist militants were believed to have bases. Earlier the same year a US aerial gunship bombed insurgent positions in southern Somalia, coming to the aid of the Somali government forces which had ousted the Islamists from most of the country's southern and central regions. The US military's Combined Joint Task Force/Horn of Africa is based in Djibouti and patrols the Indian Ocean and the Gulf of Aden with the aim of reducing the threat of terrorism. Since the Islamists were ousted, they have been carrying out attacks against government officials, Ethiopian forces -- who are backing the Somali government -- and African Union peacekeepers. Most attacks have been around the capital Mogadishu. Somalia has never really recovered since the 1991 ouster of dictator Mohamed Siad Barre plunged the Horn of Africa nation into widespread clan fighting.